Blaine School District will be hosting two upcoming training opportunities through the Birch Bay Blaine Thrives initiative. On Wednesday, January 30, a presentation will take place in the High School Theater from 5:30-8:00pm on “Teens and Risk Taking”. Counselor and educator Kate Haskell will talk about the exciting time of adolescence and brain development. A youth panel will talk about their experiences and there will be opportunities for group conversation about how to support opportunities for healthy risk taking. This free presentation is open to all youth, parents, and professionals interested in supporting healthy youth opportunities in the community. Parents and caregivers in the community are also invited to attend the training “Wired to Connect – Understanding Childhood Trauma and Building Resilience”. The cost is $20 for this event which takes place in the District Office boardroom on Thursday, February 21st from 12:00-3:00pm. Preregistration is required and can be linked from the event flier. Presenters will share and explore with participants on how toxic stress effects brain development, the prevalence of adverse childhood experiences, and the science of resilience and hope. 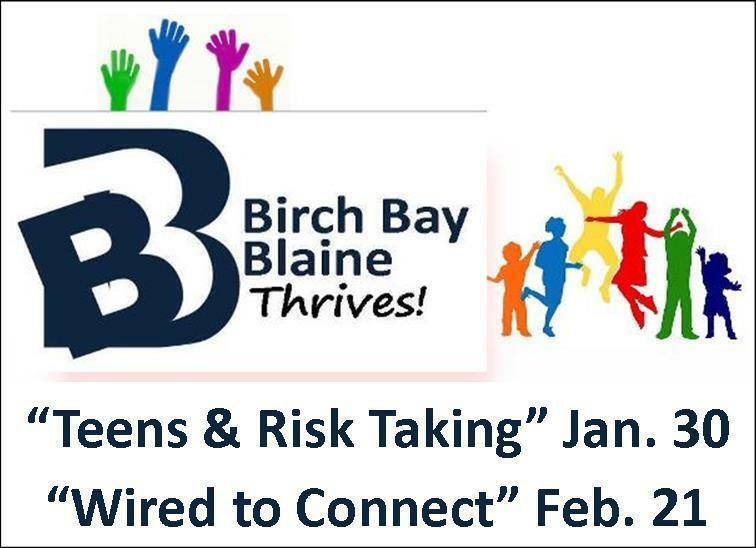 Please visit the Birch Bay Blaine Thrives web page for additional information about these opportunities, as well as information about efforts to provide additional social, emotional and behavioral support services for students and families.